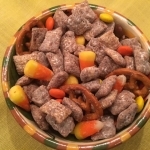 Pour Chex Cereal in a large bowl and set aside. In a microwave safe bowl melt chocolate chips, butter and peanut butter together on high for one minute. Stir and return to microwave, microwaving in 30 second increments until melted together and smooth. Stir in vanilla. Pour chocolate-peanut butter mixture over the cereal and gently stir to coat. Place cereal in a large zip lock bag, pour powdered sugar in, seal and shake until evenly coated. Spread cereal out on to wax paper and let cool completely. Adapted from Chex, General Mills, Inc.